The language school UKEC Academy was founded in Manchester, England UK in 2003. 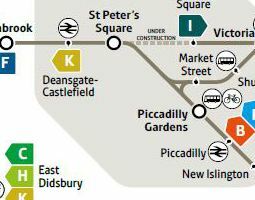 The College is located in the heart of Manchester. 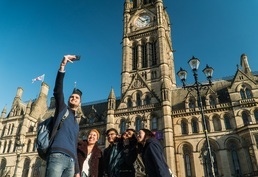 Manchester is a vibrant city with a large student population, 2 big football clubs and a lot of cultural sights. It provides General English, IELTS and Cambridge exam preparation courses. 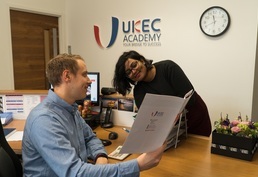 UKEC Academy operated previously under the name Excel College. Generally course material has to be purchased by the student. The costs of course material will be approximately 30 £ per course level. Best arrival airport is Manchester Airport. In 2019 (including national and regional bank holidays): 01.Jan.2019, 19.Apr.2019, 22.Apr.2019, 06.May.2019, 27.May.2019, 26.Aug.2019, 23.Dec.2019 - 31.Dec.2019. Full time course of General English and Academic Skills. Afternoon classes three times per week. 10.00 % discount: 10.00 % discount on tuition fees only. Only valid for bookings at this website before 27.05.2019. Only valid for courses starting before 27.05.2019. 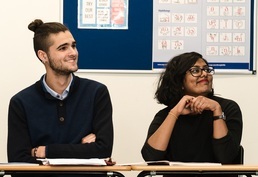 - Get a 10% discount for your summer course (discount applies to courses taken in June, July and August) . Only valid for bookings at this website before 31.05.2019. 15 General English lessons plus 6 IELTS exam preparation lessons. 15 general English hours in the mornings + 10 IELTS exam preparation hours in the afternoons. Note: All courses offered by UKEC Academy, Manchester can be reserved online with LanguageCourse.Net. In case a course is not listed above, just mention the course description in the comment field of the online registration form. 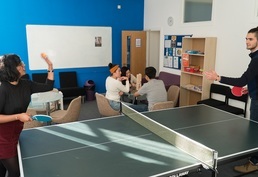 Individual classesSingle individual lessons of tuition can be reserved at 50 £. The combination of group and individual lessons is highly recommended. Individual lessons will encourage you to actively speak the foreign language and will offer you the opportunity to discuss individual problems and weaknesses. This residence is in the city centre. Students are expected to wash dishes, take out the rubbish, clean their own bathroom and keep their bedroom tidy. TV, Towels, Bedding/linen, Weekly cleaning, Access to laundry service, Access to Wifi in building (Free WIFI), Heating, No meals, Private bathroom. -Special diet supplement: GBP 20 per week. -Under 18 homestay: GBP 20 per week. 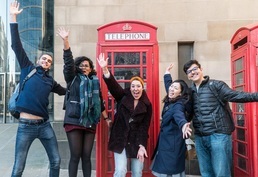 -Accommodation change fee: GBP 50.
Insider tips about what future students should not miss: 30h/week have lessons in the morning and in the afternoon, even if it doesn't leave you with a lot of free time to visit the city, it's worth it as groups in afternoon lessons are even smaller than in mornings. Other comments: Due to students English level, the higher English level was upper-intermediate, if you are looking for some advanced level classes you may ask if any advanced class is open. Insider tips about what future students should not miss: The students shouldn't forget to wear the name tag. Other comments: I learned much more than I expected. A PDF with a quote for UKEC Academy is being sent to your email. Keep it for your reference or share it with someone else if you like. Your query has been sent to UKEC Academy to confirm availability of your chosen course on your requested dates. Request sent to UKEC Academy.